It was time. Excited parents and guests packed the auditorium. In the wings, students busily tuned instruments, sheet music and lyrics in hand from days of careful rehearsals leading up to this. A primary ensemble stood. Hands held to instruments. A deep breath. And music! The audience erupted in applause. Hosted by Senior students Rebekah Rivas and College Music Captain Melissa Bird, the annual Soiree was underway. And this year promised to be better than ever. Choirs, ensembles, and solo performers from trombone to voice rounded off the first half of the evening. One of the highlights of the evening was Primary singing sensation, Txai Anglin. The year 6 student is becoming a well-known figure in Australian theatre. Fresh from an A (with Honours) result in her Musical Theatre exam, Canberra production of Beauty and the Beast and Harvest Rain’s production of Hairspray, Txai played both saxophone and sang a solo piece. 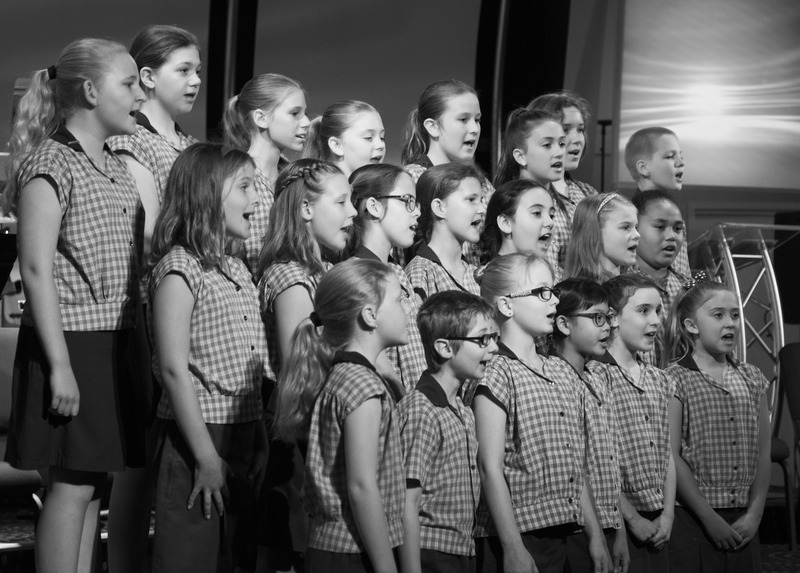 The Primary Choir perform at the annual Soiree. The annual Soiree aims to not only promote the talent of our students, but provide recognition of their hard work, dedication and bravery as they performed in public. It also raises money to further the program and inspire future generations of creative talents. It was a fantastic night of music that was shared by many. Senior Music students also took the opportunity to honour their teachers and tutors for many years of tutelage and friendship. Westside Christian College wishes to thank everyone who took time out of their busy schedule to support the Music Department and share such a great night. Stay tuned for more.